Profile: The renovation of the executive offices at the maintenance wing allowed for a new command suite that improves efficiency, accommodates additional personnel in limited space, and provides a state-of-the-art conference room. The renovation of the Conference Center includes a command center with a 2.3 HD video wall, videoconferencing, audio conferencing presentation systems, document cameras, and a 12-seat dais. The space can be arranged to accommodate different meeting configurations, reducing off-site travel time and expenses. 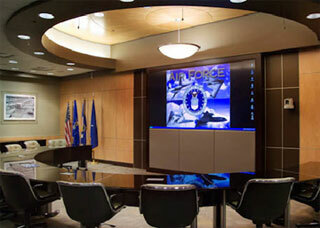 The conference room is designed for immediate communication with the Operations of Aircraft and the Pentagon. Services: DataCom Design Group was instrumental in establishing the design layouts of the room and worked within the existing building's column structure. Our consultants provided advanced technology design, AE coordination, and acoustical consultation for the project. We worked closely with the General to determine the communication needs, while deploying sensitive intelligence information to and from the Base.